Question: How does the transformation in which the attribute of bestowal dresses in the desire to receive take place? Answer: Before I used to reject the use of the desire to receive and constantly built the desire to bestow above it. Now, however, I begin to receive in order to bestow. This is a very special transition indeed when I operate the vessels of receiving. This is how the transition from the state of smallness (Katnut) to the state of greatness (Gadlut) is made, when the angel of death becomes the holy angel. This is called true mercy (Hafetz Hesed) and it is a very high and sublime state. Without it I cannot contain all the Light of Hochma and receive in order to bestow. It has to provide all the intentions of in order to bestow for all the vessels of receiving. I fill all my desires with the Light of Hassadim and decide to work in Hassadim, from within Hassadim. In order to receive pleasures, I develop a new desire for them that is 620 times greater and receive them only for the sake of the Creator, only in order to show Him my love. All this is based on a new attitude that is sustained by the fact that internally I am still Hafetz Hesed. Even if I receive the Light of Yechida at the end of correction, I don’t do it for myself. Personally I don’t need anything and it is all for the Creator. This is not weakness anymore but the basis of all of bestowal to the full height of the greatest Lights, Haya and Yechida. Question: From where can the external public, for whom we disseminate, get some spiritual desire if today people have quite different concerns? How can we translate their requests into a prayer upward? Answer: If people are not dissatisfied with life, we are not allowed to come near them. That is why we have been waiting for all these 3,500 years since the exodus from Babylon. And only now when the crisis is unfolding in the world, the need for change arises in people. Some people agreed with him and he took them with him. But the rest said they would sort it out without him; they let him go and kicked him out of Babylon. He would have stayed there. But when he gathered his group and went deeper into this work, he realized that first of all he needed to prepare Galgalta ve Eynaim and then armed with the corrected GE, he needed to go to the AHP and correct it. Thus, he left Babylon and went to the land indicated by the Creator. You can talk to a person only in his language, accepting his claims. We turn only to those parts of the population who feel they are in poor condition. We do not address the middle class, who are well for the time being, but only those who need help. There are people who do not see that a problem exists, and even if they see it, they think that it does not affect them personally. We do not need to appeal to them either. We address only those who are in crisis. Indeed, the crisis is such that they do not feel that they are able to correct life, having lost all hope. They have nowhere to go for help, and they feel despair and helplessness with no hope for the future. For the time being, the middle class does not feel these problems, but judging by the speed of the crisis, in six months the middle class will become in the lowest condition. The middle class will disappear all together: There will be just the elite and poverty. Then you can talk to those who have fallen down. In six months, maximum a year, the middle class will fall into such a state that they will be completely ready for our explanations. Everything depends only on the number of blows that a person gets. If he loses hope for the future, then we can already talk to him. And it will happen very quickly. Now, they still cannot hear us, only those who have the point in the heart. But these people are few and usually they are surrounded by a society that suppresses these sparks in the heart. A person’s spiritual spark is enslaved by his egoism, is under many burdens: the family, children, the opinion of the environment, liabilities, and debt. A person is deliberately tied to debt so he cannot escape. Today’s economy is based on debt rather than profit. Everyone owes a quarter to half a million dollars, including newborns. It binds the person to a system and leaves him no free choice. It is very difficult to break free from these chains. Question: Would you say that the path of “hastening” and the path “in its time” are two different vectors? Answer: Advancement “in its time” is not a vector. Let’s say, now I’m in a certain state (1), which has to move on to the next one (2). To cover this distance, we must hold on to the principle of the unity of Israel, the Torah, and the Creator. If I direct myself in this way, then I advance by the path of hastening. But what if, having gone some part of the path, I suddenly fail? What if I was not successful here, i.e., failed to equip the desire that was revealed to me on this stage with the altruistic intention? Can I move on without the right intention? No, I cannot. Consequently, there is no path by which you can move forward “in its time.” I have to stand here with my incorrect intention (←), which pulls me to the “left,” to the material. Next, I need to come to the realization of evil and then get back on track. However, to realize evil, I have to enter it, exert myself, make up for all that is missing, come to an inadequate result, be sorry for what happened, and then go back to the acceleration vector. Thus, I have no chance to advance to the goal “in its time,” even if a thousand blows force me. After all, they are not punishment for mistakes. I still need to make calculations and afterward identify the true evil and see that troubles are not evil but good. I seemingly kiss the stick, thank the Creator for its blows, “Thank you very much, that’s great because now I realize that I am in evil.” Moreover, I am aware that blows are goodness, and what once seemed as pleasure to me is a bad thing. Thus, misery lets me get closer to the Creator. However, along the way I have to feel and comprehend so much, to change so much in myself on this long path of suffering… It is called this but in fact it is not even a path —I just make a turn and come back. And this turn may take not a year or two, but say, twenty years. Question: How can we accelerate along a straight line? Answer: You can speed up along a straight line if you are constantly connected to the center of the group, again and again. Taking the steps on the way means realizing one’s free choice. But its realization is to strengthen the group, which is the only means of achieving the goal. Question: Where is the center of the group found and how do we direct ourselves towards it? Is this a mental activity? Answer: The center of the group is found in a place towards which all eyes and all hearts are directed, at the point where the friends expect to get a response for all of their efforts. We have a common task and each one of us invests in the center of the group to the extent of his efforts and desires. In other words, the center of the group is the center of all the investments and hopes, the location of the prayers, and from there all of the requests rise upward. We invest all of our lives in the center of the group and we want the center to become the conclusion, the result of our lives. We want to discover the guarantee there, for otherwise we cannot discover the Creator. The guarantee and the Creator, the Kli and the Light are discovered together as one thing. One cannot be without the other. From the beginning of creation, there is no Light without a Kli and naturally, there is no Kli without the Light. This is what the Ari tells us in “The Tree of Life”: “Behold, that before the emanations were emanated and the creatures were created, the upper simple light had filled the whole existence.” This is to say, the reality and the Light already existed. One never existed without the other. In the thought of creation, in the program of the Creator, the two components already existed as a single whole. There is no benefit to the Light if there is no Kli. Therefore the center of the group is the place in which the Light and the desire need to be discovered together. This is the place in which the Creator is discovered within the creatures as a result of the correction of our properties. The Kabbalists say that there must be at least ten people who invest effort in accord with the complete spiritual structure of the Ten Sefirot. 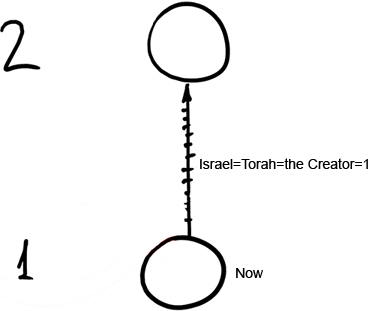 If the group of ten (Minyan) invests effort in order to be a single whole, then in its center the Creator is discovered. In order to be a single whole, they must maintain the general rules: “Don’t do to your friend what would be hateful to you, and you shall love your friend as yourself,” which means, to yearn for connection, unity, to be like one person, so that in a link between us, the characteristics that we attribute to the Creator will be discovered. For we mold the Creator within the Kli, within our desire. And the moment that this desire will be somewhat like the Creator, to the smallest degree, then to that degree we can immediately discover Him. For this, a complete Kli is required, a HaVaYaH, the smallest Ten Sefirot, but it already exists. To the extent that we kill our egoism, the image of the Creator begins to live in us. The attributes of the Creator live only in those people who kill their egoism for His sake, for the sake of His attributes of bestowal. The center of the group is everything! There, in that center, all the worlds, Partzufim, Sefirot, the entire spiritual ladder, and the world of infinity are revealed. Everything takes place only at that center because when we begin to reveal the true concept of the group, it turns into the limitless vessel of the world of infinity for us. We learn all the systems—the entire world of Atzilut—from the center of the group. 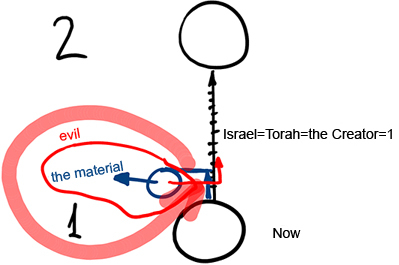 So, when the creators of The Book of Zohar got closer to each other, to this center, they attained something new and told us about it. Thus they wrote The Book of Zohar, chapter by chapter, from attainment to attainment, defined by the measure of their unity. Attainment comes from a new place every time: from Rabbi Yossi, Rabbi Abba, Rabbi Elezar, Rabbi Shimon himself, depending on what Sefira of the 10 was the most important in this attainment, and a new look, a new perspective, opened through its properties. Each Sefira is a different quality; that is why we see a complete structure through the prism of one quality or through the prism of another, which helps the understanding. Question: The Creator said to Abraham: “Thy seed shall be a stranger in a land that is not theirs, and shall serve them and they shall afflict them four hundred years.” Why does the exile have to be accompanied by afflictions? Answer: This is the period of the exile by definition. You know that you are about to go through very bad experiences. Then the seven years of satiety are over. Do you wish to continue this “dream flight” endlessly? But suddenly something changes and you don’t have any idea why. We can see this especially among young people: There was a generation of “flower children,” hippies., then people lost interest in having children and getting married. Many settle for drugs instead of grand projects. No one is interested in flying to the moon. Space and the stars are not as attractive as they were before; what do we care about them? Humanity has suddenly lost its future. Why? What is the reason for that? We know where this stems from: People have fulfilled the end of their ego. It has dried up. So today we seem to be going backward. The same ego that we developed has begun to consume us now: Today’s food only causes us harm, social services don’t function as they should, the healthcare system only wants to make a profit and doesn’t care about your health, governments only exploit the citizens. The ecology is an excellent example of our carelessness: We don’t care what will be left for our children and grandchildren. What is more, many people don’t have children at all. If this goes on most people will have no children in the next generation. Thus the ego consumes itself during the seven years of famine. “Want” in this case is the recognition of evil, the same ego that we have developed during the seven years of satiety. Although things can get even worse and there could be world wars and other disasters, it is still possible to come to a conclusion and hasten the exodus from Egypt. It all depends on us. But it is impossible to manage without the feeling of sorrow here, without the exile. Exile means the lack of the Creator’s presence in me, in us. We can feel that only when we are dispersed, separated, divided, and shattered. Then in the final phase of the exile, we want to connect since in the connection we can find the new, inner, upper force. Who can do that? Only a small group of people. This is the time we are living in now. We can hasten our development and turn away from the path of deadly afflictions, which means that the path of “I shall hasten it” exists. But how? Through integral education and the dissemination of the wisdom of Kabbalah, since this is the reason it was given. Otherwise we could keep on developing along the path of suffering. The wisdom of Kabbalah was given to us so that we will advance by the path of “I shall hasten it,” and not by the path of “in its time,” in order to summon the Light that Reforms and not to wait for the troubles and blows. But I’ll say it again, the sufferings still have to be felt, all of them. The question is when will we be smart enough to transform the corporeal sufferings into pangs of love? When will we want to love, to bestow, to connect? This depends on our dissemination, on your attention, and your sensitivity. Question: It turns out that no matter what efforts we make, the troubles and the blows will be even stronger. Answer: No. The blows will be more qualitative. We will perceive them in our understanding and our feeling. They will be sweetened blows if you are connected to the center of the group. Then you will receive these blows but in the Light of Hassadim, which means that they will not be blows and troubles. The point is that you will have to receive a medicine, but its bitterness will be concealed by a sweet coating. My Comment: Nostalgia is the lot of the elderly who have no future, ideas, and understanding of how to live further. We need to change not the system, but the human being. Many are already thinking in this direction, although they cannot find the means of change. It is possible to change a person, but only by the influence from Above, by the force that is manifested in our correct unity. This is what the method of integral education teaches. Question: People who have passed through a series of roundtables, as a rule, don’t want to disperse, they become sympathetic to each other. Therefore, it is necessary to help them to create a fellowship with common goals. What is this fellowship? Answer: People who create integral fellowships suddenly begin to feel that someone understands them, that they can find a common language between them, and even though the point of view of one is opposed to the opinion of another, he is ready to cooperate with the rest, ready to accept them, this becomes their goodwill. This feeling that is created as a result of communication like this gives a person a feeling of a new world, a new understanding, new sense of peace, and cooperation, everything that is so lacking today with people. Therefore, they don’t want to part, and this is felt very strongly. When we expand the range of issues discussed, they are ready to talk about other subjects and find a wider and wider platform for interconnections. They begin to be attracted to each other, begin to feel that they are found in one bundle, like mountain climbers or divers, so much so that a feeling of belonging to one shared whole takes hold of them. So far, throughout the history of humankind, only those with a point in the heart established a connection with the upper force. And for mankind in general this relationship is not required: All of them had their own gods, their beliefs, that originated in pagan Babylon. However, in this modern era, deities are being cast down from their pedestals. People are giving up their religions and ceasing to believe in science and are immersed in crises, not knowing where to turn for help and how to rebuild their lives. The human world is collapsing. Previously, the belief in a higher power strengthened people in the face of adversity, and even death left a hope for a future world. However, today these arguments do not work, so now is the time to speak to the people. We can be their loving parents. Of course, we must bear his message carefully and put it in specific explanations that are appropriate for a particular audience. Meanwhile, day by day, from election to election, people are increasingly aware that no one will help them. Gradually, they are forming a distinct, clear sense: Nothing will move toward the future. This allows us to declare our message because our solution is completely different from the others and our voice continues to ring out when the others die down, when all the gates are shut except the “gate of tears.” This decision comes to a person only when he is desperate and sees no way out. Then, he is suddenly ready to hear us and receive our words: here lies the opening, the “eye of the needle,” through which to escape from disasters. In fact, one feels that here lies a relationship with a higher power and the opportunity to use it. We offer him a chance, a special technique, that allows him to awaken contact with the “upper energy” that can fix us, fix our world. We, ourselves, do not do anything; we only open this tiny door slightly, and everything else carries a huge “energy” of a higher order. So, let’s make a seminar in the right interaction between us. People are ready to hear us. Question: Unfortunately, we hear only the oppressed, those who work from morning to night, from which there is no exit, no escape from the modern “slavery.” And it’s scary: Can they really hear us only when everyone will be in a position of absolute hopelessness? Answer: No, it’s just that one hears according to his current state. Do not think that the “great world” turns a deaf ear to our promise. The current arrangement does not relieve them from worrying. After all, global trends are a great concern. In fact, we have lost control over what’s happening. It is like we are in a car with no brakes on downward slope, with no end in sight. We cannot get out and cannot do anything. The steering wheel barely holds us on the road, the speed is increasing, and we already can see that soon we will not be able to control the car. Once on the road, in a similar situation, I clearly saw two possibilities: either crash into rocks or turn into a bus in front of me to mitigate the blow a little bit. I was on a long descent downhill, I had to do it, and I used the opportunity since otherwise we were heading for disaster. So, I think that those in power, too, feel like this today, but still do not hear us about a decision. We have not tried to really get through to them. Anyway, we must continue to disseminate widely, without despair. Perhaps, we will be heard in ten years. So what? The global crisis, in any case, will not end until we connect to humanity with the right intention. It will only increase, coming in waves, falling back time and time again, attacking the various spheres of life. The same disease enters the body, and while hidden affects the tissues and organs until the next paroxysm. The current crisis has not been overcome. It is just cyclical, and ahead of us are the hardest stages. It will be “cleaned” before the end of humanity. It “will squeeze all the juice out of us,” clueless with no opportunity to escape. Nothing will help: not religion, not riches, nor hope for loved ones. Children will betray you, your family will throw you out of your house, and you will not find a home anywhere else: All of this if you’re not ready to accept the method of correction. Of course, the goal is not to do away with humanity; it is only to summon you to the right intention. Do you want to change, to gain equivalence of form, and rise to the level of the Creator who sends you this trouble? Yes, it is He. Rise to the next step and look at what His intentions are. Grow up, be with Him in mind, and suddenly you will see that it is not trouble, but the expression of love. This feeling suddenly is born into your new vessels, desires. Moreover, you will find that in the past there was never any trouble and He did not send anyone suffering. Now, you will get a clear understandable view. Question: Will we, at least, be able to cope with the problems? Answer: Under the current approach, no one will be able to cope with the problems of the world. Day by day, year by year, we only weaken under their yoke, plunging into despair, feeling helpless, and not wishing to make any effort. Conversely, if we have the right approach, if people would correct themselves, they will not have to confront the issues. Adversity will become merit, pleasure, and the world a vessel full of all good things. If we go out to the wide audience without concern for our inner connection, then why are we going out? We aren’t going to educate them, to campaign for a healthy lifestyle, or to moralize. There are many other organizations and associations that have many means, vast resources, talented leaders, and we cannot compete with them if we are not equipped from the start with the spiritual power of our unity. So we need to understand clearly with what we are moving forward, what our goal is, and what the means for attaining it are. Our goal is the revelation of the Creator in the world, and the means for this is the Light that Reforms. This is our uniqueness; we don’t have anything besides this and we also don’t need anything else! We must be very careful not to mix and add some other kind of tools here. Therefore, the power with which we fight is mutual responsibility, which brings us to faith, that is, to bestowal. In this way we attain everything; the Creator will fight and not we ourselves. We only need to constantly adapt ourselves to open the way for Him. This is called the war of the Creator, serving the Creator. We constantly need to remind ourselves, always formatting ourselves anew to adapt ourselves a little more and a little more. The tunnel through which we are passing is becoming narrower and we need to adapt ourselves more and more precisely to its format, to its form, and to gradually advance in this way. Therefore, what was yesterday is already past, today more is required, and tomorrow even more will be required. We need to to adapt ourselves to the instructions of the sources and the teacher in a more and more precise form, and to try not to forget and understand what the goal is. Sometimes we forget about this and are confused. The Kelim are renewed all the time and again drop us back into this world. “Shattered Kelim” are discovered and bring us down again; we must consider all kinds of external factors that distract us from the goal. Therefore, the group must hold, support, strengthen, and demand of each one. If the condition of mutual responsibility acts among us where each one is concerned for the others, is responsible for them so they will not lack anything and will have everything necessary, then a group like this is called Israel (Yashar-El). And then it deserves to receive the Torah. And we must explain all of this to people. Maimonides once wrote that to women and children it is necessary to reveal this secret gradually, in other words, not to give all the explanations at once. But Baal HaSulam wrote in the article, “The Arvut (Mutual Guarantee)” that the time has arrived to reveal the true meaning of serving the Creator to people. For we are already found in this kind of crisis and despair, people already feel they have exhausted their own powers and that they lack the means to change anything in the world. Therefore, we must tell them about working with mutual bestowal in its cleanest form. Only if we reach a state like this will everything be okay. It’s not even necessary to conceal this; this must transform into our “credo,” into our foundation. We suppose that the world must reach this form and that’s it! These are our views and our knowledge that the wisdom of Kabbalah speaks about. If we begin to pretend, then with this we distort and destroy all of our work. For to the degree that we outwardly tell a lie, we need first to be clothed in it internally. And this is not worthwhile to do.